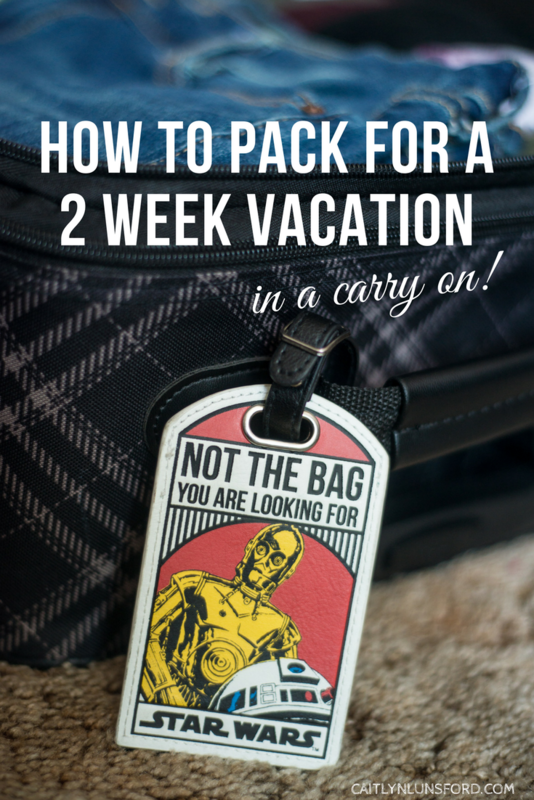 How to Pack for a 2 Week Vacation - In a Carry On! 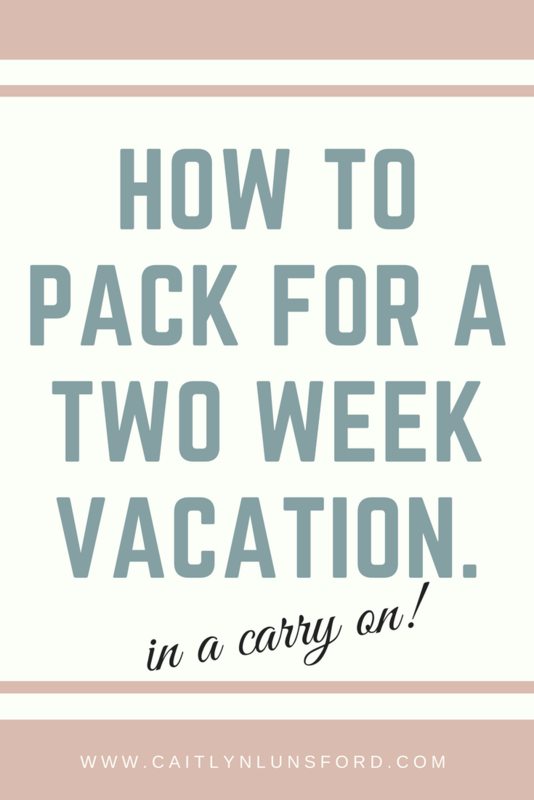 In seven simple steps, I will have you packing your carry ons like a pro! In a few days, my husband and I will be boarding a plane for a two week, standby adventure! My baby sister is getting married, so our first stop will be Ohio, where we will visit my family and witness Autumn and Colton finally tie the knot! Once they get married, we will be up in the clouds again on our way to beautiful and tropical Maui! When I travel, I am usually flying standby, so I prefer to take only a carry on rather than checking a large suitcase. I like to keep my things with me, no matter how many times my baggage handler husband tells me my bags won’t get lost! In my mind, carrying my belongings on to the plane saves precious time. Instead of waiting around at baggage claim, watching the same suitcases go around the carousel over and over until mine finally appears, I could use those wasted minutes to start my vacation! Most airlines, in the United States, allow for a small carry on suitcase and one personal item, which is plenty of space for my camera equipment, clothes, laptop, toiletries, and all the other things I bring with me on trips. 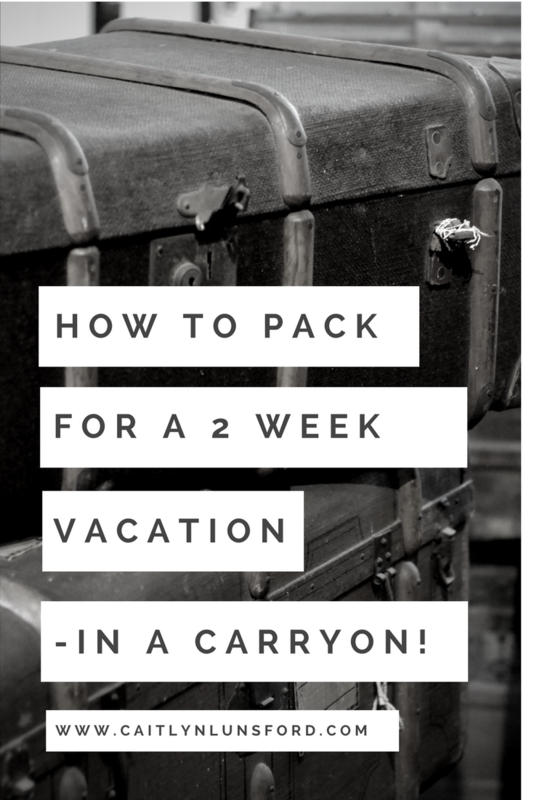 Packing for this particular trip was quite a challenge, because I had to account for very different weather situations, but I still managed to fit it all of my clothing into my carry on and I want to tell you how I did it! I recommend starting with what you wear on daily basis. Just because you are going to be in a new place doesn’t mean you are going to dress differently than you do where you live. I took all of the shirts that I wear often out of my closet and put them on my bed, along with a few dresses, pants, and shorts. Try to choose clothes that are easily mixed and matched. I opt for a lot of jeans and t-shirts because it’s easy to pair them together. You might also want to consider things you can layer. You probably aren’t used to the weather in the new place you are going, so you might want to put on or remove pieces of your clothing. 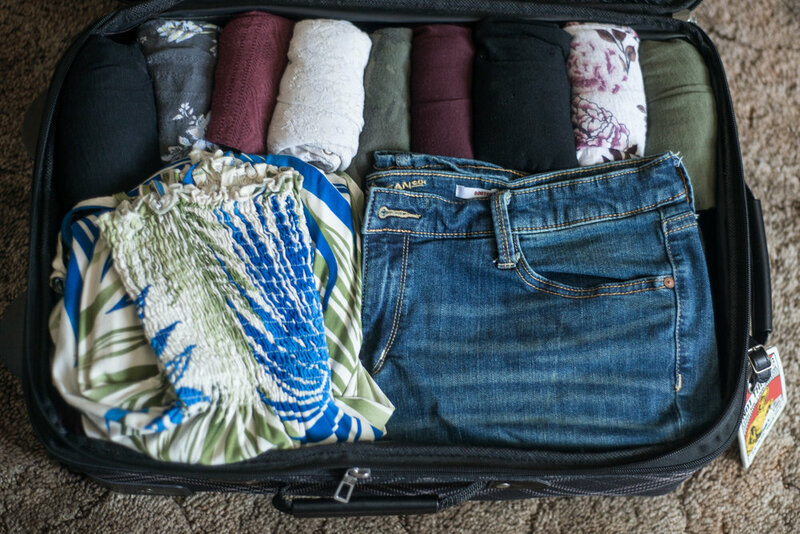 I put my pants into my carry on first because they take up the most space, almost half the surface of the bag! Unfortunately, I haven’t figured out any tricks to make them smaller. I also include dresses in this section because they are bulky as well. Step 3: Roll your shirts! But the point is, she had enough space for 10 books! The tiny bit of space above my jeans and other heavier items is just enough for my rolled shirts and I can fit two per stack. Add in your socks and underwear wherever it will fit. I usually end up adding those items to the lid pocket, but if you aren’t taking eighteen shirts like I am, they might also fit above the heavier clothing. I wear a sweatshirt on the plane, but if I need an extra jacket, like I did during my trips to Ohio in January and March, I will lay that across everything in my carry on bag. I also wear my bulkiest shoes on the plane to save space in my luggage. I know, it’s a pain when you have to go through security, but that is what works for me. Flats and flip flops fit a lot easier than boots do! Most airlines don’t specify what actually counts as a carry on, so choosing that can be a little bit tricky. Usually, it needs to fit underneath the seat in front of you. I always use my Jansport backpack and it fits just fine. This is where I pack my laptop, camera, toiletries, makeup, wallet, and anything else I plan on taking with me on the trip. Handbags and purses are considered a personal item as well, but I can’t fit nearly as much in those than I can my backpack. 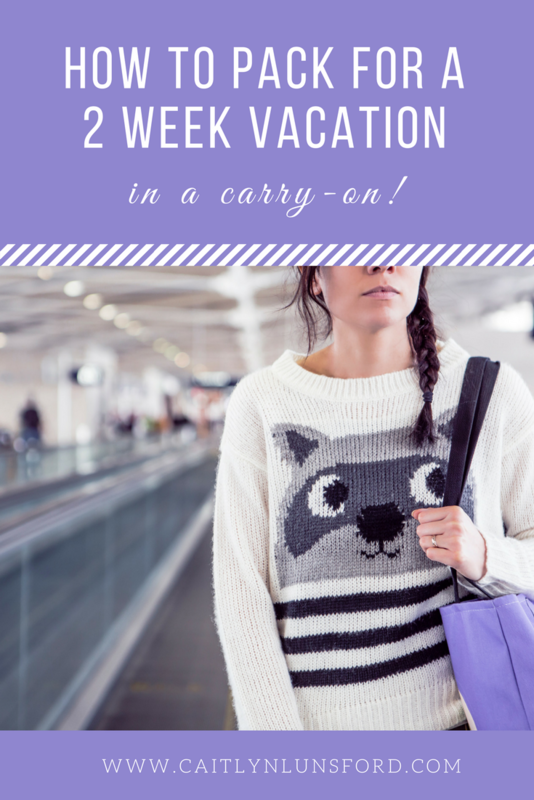 If you plan on carrying a handbag or purse during your trip, I suggest packing it in your carry on bag or personal item for later! 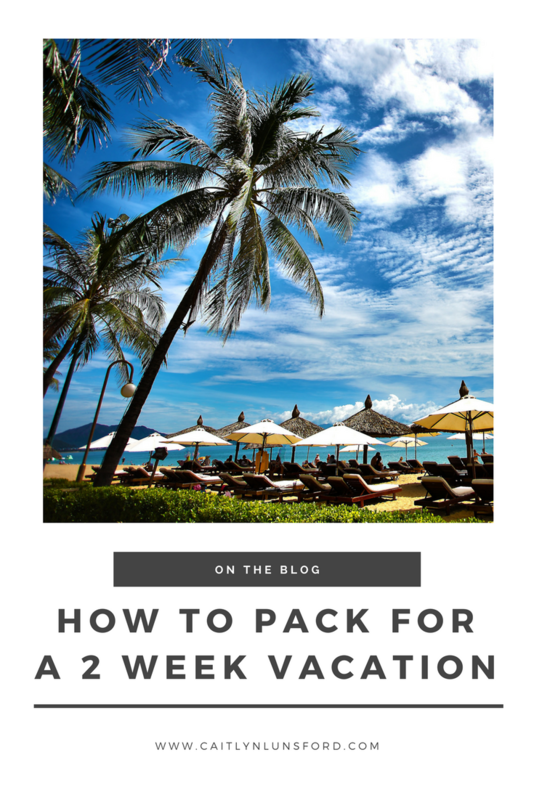 Step 7: Have a great trip! Whether you are going on a tropical island getaway or a ski resort in the mountains, I hope you have a fantastic time and make a lot of memories! Don’t forget to take a lot of pictures and tag me using @caitlynlunsford so I can see all of the beautiful places you have been!